When men control the narrative and tell stories, we miss out on the diversity and richness of our ancestor’s lives. Growing up, I was constantly taught that the kola nut was reserved for men. Women were not to look , touch, or eat the kola nut. Being a chief, my dad frequently had visitors over the house. 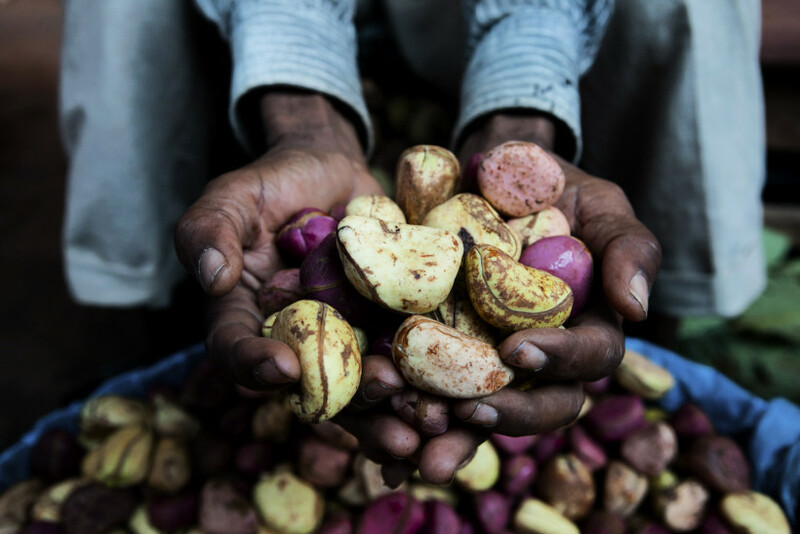 In Igbo tradition, the kola nut is a form of welcome and hospitality. The kola nut tells a story about where you have been and where you are going. One cannot visit another's house without taking kola nut back to his people. During the breaking of the kola, the kola is passed around from the youngest to eldest and the oldest (or the priest/pastor if present) prays over the kola. During the prayer, the oldest man calls upon the ancestors to bless the visitors and wish them with long life, good health, and prosperity. I always watched this ceremony from afar. My dad taught my brothers how to cut and pass around the kola, but never engaged me about the importance or role of women. For a long time, I assumed that kola nut was reserved for men. At parties, men would pass up all the women in the audience and give kola to boys age 2 to men aged 92. Every time I reached to pick a piece of kola, I was shunned and ridiculed. Recently, however, my dad explained to me that women do have a role in the breaking of the kola. We were at a family friend’s house and the host brought out the kola to bless and distribute to my dad. At this time, I was sitting across from the only other woman at the table, a reverend sister who is also Igbo. We stared at each other and mocked the process by closing our eyes. After the prayer was done, she said to me , “ Don’t you know , women are not allowed to look or eat kola.”. I laughed. He continued, “Women are the only ones who know where the kola nut is located in the home. In fact, the woman is the first person to see the kola and bless the kola because they go to the market to buy it. Women store the kola and preserve the kola. A man cannot give kola to his guests unless his wife approves of it." I was amazed (not really though) at how determined men were to create narratives in their favor. I was astonished at how men wanted to maintain control over very important and sacred cultural ceremonies. How would it harm a man to know that a woman is the custodian of kola nut? Much of how we view gender today is influenced by western Christian ideology. We know that women had more rights and more social power in pre-colonial Igbo land. This is not to romanticize the past or to claim that patriarchy did not exist. We are all aware of the Aba War of 1929 , where hundreds of women in Southeastern Nigeria protested against patriarchy and colonization. This war is often reduced to a "riot" against taxes, but Toyin Falola and other authors have explored the multiple causes for this uprising. We are all dying. It is a long time since the Chiefs and the people who know book… have been oppressing us. We are telling you that we have been oppressed. The new Chiefs are also receiving bribes. Since the white men came, our oil. Does not fetch money. Our kernels do not fetch money. If we take goats or yams to market to sell, court messengers who wear a uniform take all these things from us." This passage highlights how colonialism drastically changed the economic, social, and political status of Igbo women. Igbo women were active in trade and often provided economic security to their families. Women had access to and the resources to sustain themselves. When women are empowered, communities are empowered. When Westerners came, they limited a woman’s access to education and work. Colonizers took over the markets that women previously operated and benefitted from. When women are not empowered, communities suffer. So it is important that we continue to tell the stories of the women that came before us. Revisiting the past gives me hope that we can create a better society for our girls. My ancestors give me the inspiration needed to fight for justice and equity for women, specifically Black women. We must continue to tell our stories and ask more questions. Culture is not stagnant. Reject the statement, “ This is culture”. Culture is the way human beings react to the environment they find themselves in. As such, as the environment changes (which it always does), human beings create and/or adapt. When we present alternative narratives, people begin to reimagine a world they wish to live in. We must control our stories. When stories are solely told by men, women are erased or reduced to stereotypes. Interestingly enough, it is my dad who told this story and he is a man.